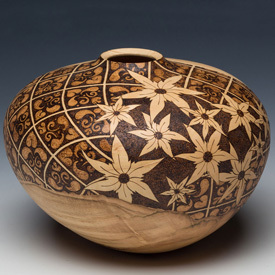 In this three day class, accomplished pyrographer and instructor Megan Williams will teach beginner students the fundamentals of successful pyrography. This will include the proper selection of equipment including different types of pens and materials suitable for pyrography. By the end of class, students will have a working knowledge of how to create lines with the desired value, shading and texturing along with creating custom designs and transferring patterns to the work piece. This 3 day class does NOT involve woodturning. Megan Williams is a talented, self-taught woodburning artist and her work rivals that of any recognized professional. She has a talent for teaching in a clear, concise manner while making students feel comfortable and at ease. Megan’s friendly, outgoing personality and love for woodburning is sure to help students have a great experience during the class. Our workshop is located in beautiful Provo, Utah, just 40 minutes south of Salt Lake City. Upon registering for a class, you are only charged a deposit to reserve your seat. 6 weeks prior to the class, you will be charged the remaining balance due. We will send you a packet containing helpful information when planning your trip, including hotels near us and other fun things to do during your visit to Utah.